Drew Stevens is a journeyman tool and die maker and automation engineer, and is author of the book, Die Protection for Lean Manufacturing: Error Proofing Concepts for Toolmakers and Die Designers. Order the book at www.pma.org/marketplace. While not every stamping company can build smart dies that adjust themselves, or use RFID-enabled cribs to track supplies, there are two constants that affect every metalforming company in the world: poor-quality parts and unplanned downtime. Smashed dies and bad parts affect everyone, from managers who must explain a late shipment to a customer, to a production scheduler who must find time to complete a run after the toolroom has put in extra hours to repair broken dies and create fixtures to rework bad parts. Fig. 1—Exact Tool & Die installed four sensors in this die to detect the presence of a broken tap in the strip. Because the sensors use background suppression, only the tap will be detected. This eliminates the chance of nuisance faults caused by any other die components. Exact Tool and Die, Inc., a medium-sized manufacturer on the west side of Cleveland, OH, began in 1978 as a builder of new tooling for stamping companies, entered the stamping business in 1993, added an assembly area and, most recently, added a waterjet-cutting cell to its list of capabilities. Exact’s Robert Matis, who heads the firm’s design team, describes a recent project: stamping a part, to relatively high volumes, with four tapped holes. While piercing and extruding a hole to be tapped offline is certainly not a new concept in stamping, performing the tapping operation in the press can pose a challenge—reference Ray Osborne’s article on in-die tapping (IDT) in this issue. To tackle the project, Matis’ design team decided to use an IDT system (from Pronic) using rollformed taps to eliminate any debris inside the die. Tapping a hole in relatively thin material with an extruded sidewall allows the tap to float within 0.003 to 0.006 in. without affecting thread quality or hole location. For Exact Tool & Die, the challenge came from tapping four 3⁄8-in.-dia. holes in material thicker than 0.210 in. This left little room for misfeeds or broken taps. Monitoring the feed with a proprietary plunger and sensor system eliminated the chance of a mishit due to a short or long feed, but broken taps were another story. Should a tap break and move into the next station, the damage could be pretty excessive. To avoid such a scenario, the firm installed four sensors (from Sick Automation, Fig. 1) in the die. 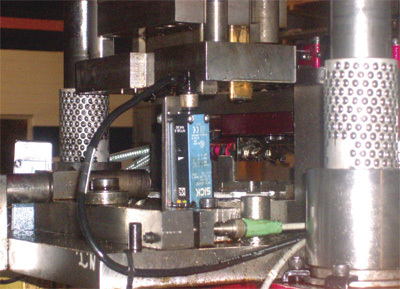 The sensors detect the presence of a broken tap in the strip, uninhibited by any coolant mist or smoke from the stamping operation. Because the sensors use background suppression, only the tap will be detected. This eliminates the chance of nuisance faults caused by any other die components. Fig. 2—Stamping heavy-gauge steel plate at KLS Controls, it’s critical that the operator loads the part into the press with the proper orientation, or the part becomes scrap. To detect proper orientation, the firm decided to look at the part from outside the die with a vision camera, using a pair of pattern-match detectors on the reference image captured by the camera. This screen-grab from the camera controller shows a yellow box, which is the region of interest. Should the operator improperly position the part, only one or none of the green boxes will appear. One of the greatest roadblocks to metalforming success can be human discretion. A minor defect in a part unacceptable during a normal production run, yet passes inspection at the 11th hour before an emergency shipment, can be confusing to the operator and wreak havoc on process management. Even the use of a go/no-go gauge is susceptible to interpretation. Use of the terms slip-fit or interference-fit often can bring different results in a quality check performed by different people. When an operation is performed manually, quality can be compromised by poor judgment, a lack of understanding of necessary features (fit, form and function) or even fatigue. For these reasons and others, introducing an automated solution to a manual task can eliminate scrap and excessive downtime. Case in point: KLS Controls, Menomonee Falls, WI. KLS president Scott Shaw describes a recent application from a customer that manufactures heavy equipment. This is a common problem—a manually loaded secondary operation that can be nested incorrectly while the press can still cycle, resulting in a bad part. Reworking the tooling or adding proximity sensors to detect part-in-place was not an option, so KLS opted for an entirely different approach. At G&S Metal Products, Cleveland, OH, the largest U.S. producer of metal bakeware, high-volume stamping often means using dedicated presses for particular jobs; long production runs with modular tooling for various similar parts; and little time for scheduled maintenance, not to mention unplanned downtime. Inherited tooling often can provide little room for design changes or improvements. And, if a die has been damaged, the die shoe may be in less-than-ideal condition, with sections altered. Therefore, consistently producing good parts from the inherited tool can be a challenge. “We improved feed accuracy by replacing the mechanical feed with an air feed and installing hall-effect sensors on the pistons. We also redesigned the top of the die to reduce changeover time to 20 min., and replaced all of the coil springs with nitrogen.” Previously, changeovers could take as long as a full shift. With movable rails in the die, changeovers for five parts with different widths and material thickness can be performed with little effort. With feed problems solved, Kerg then tackled another issue: in-die assembly of the 12 muffin cups into the frame. Some of the cups would shift during transfer, or frames themselves could be transferred incorrectly. As did KLS Controls, G&S found its solution by installing a vision camera, which detects the presence and orientation of the frame. Flags on the upstroke and downstroke of the ram trigger the camera. If the camera fails to detect the part and its proper orientation, the press stops and the operator clears the error on the PLC to stroke the press. If any part sticks to the upper die section, an optical part-out sensor stops the press at the top of the stroke. A custom-programmed PLC is used for sensor logic and for signaling emergency stops or top-stops.